Highlights: • Make multiple stops at central locations • A luxury semi-open boat cruise that cruises along all historical sights • Enjoy comfortable boats with guided tours, welcoming skipper and heated seats • Explore sites like the Golden Bend, Anne Frank, Flower Market, Red light District, City Hall, Central Station, the Museum and the City Center Hop-on and hop-off at multiple central locations: • Central Station East : Prins Hendrikkade 73, 1012 AD Amsterdam • Anne Frank House: Prinsengracht 263-267 • City Hall : Amstel 1 1011PN Amsterdam • 9 Streets area : Herengracht 468, 1017 CA Amsterdam • And many more!Check our App or website for the correct Timetable. Step on board on this luxury semi open boat cruise. 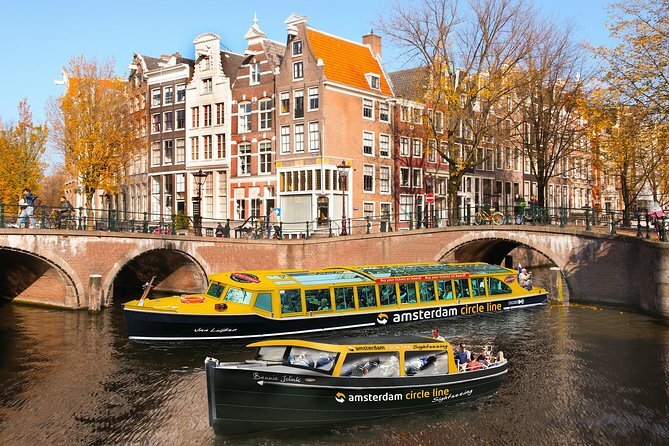 A unique cruise along all historical sights along the canals of Amsterdam. Enjoy comfortable boats with guided tours, welcoming skipper and heated seats. Take advantage of multiple stops on this unique route which bigger boats can't cruise on. A unique experience.